I’m just back from a trip to England, where I was doing interviews and archival work for Rest. While most of my time was spent in the British Library (where the John Lubbock papers are located), the London School of Economics and Newnham College, Cambridge (where the Graham Wallas and the Wallas family papers are held, respectively). But I also finally made it to one of the tourist attractions I’ve always meant to visit but have never gotten around to: the Churchill War Rooms. This inspired me to track down the book, which was recently reprinted in an excellent new edition ; and it turns out Churchill’s argument for painting fits very nicely with my book. “Many remedies are suggested of the avoidance of worry and mental overstrain by person who, over prolonged periods, have to bear exceptional responsibilities and discharge duties upon a very large scale,” he begins. Some advise exercise, and others, repose. Some counsel travel, and others, retreat. Some praise solitude, and others, gaiety. No doubt all these may play their part according to the individual temperament. But the element which is constant and common in all of them is Change. 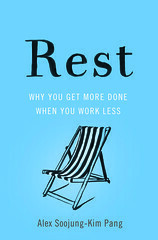 In other words, deliberate rest is the better cute for one’s worries than passive forms of rest. It is no use saying to the tired ‘mental muscles’… ‘I will lie down and think of nothing.’ The mind keeps busy just the same. If it has been weighing and measuring, it goes on weighing and measuring. If it has been worrying, it goes on worrying. It is only when new cells are called into activity, when new starts become the lord of the ascendant, that relief, repose, refreshment are afforded. reading and book-love in all their forms suffer from one serious defect: they are too nearly making to the ordinary daily round of the brain-worker to give that element of change and contrast essential to real relief. To restore psychic equilibrium we should call into use those parts of the mind which direct both eye and hand. “Exceptional exertions are purchased only by a more pronounced and more prolonged fatigue” as one ages, he writes. Muscles may relax, and feet and hands slow down; the nerve of youth and manhood may become less trusty. But painting is a friend who makes no undue demands, excites to no exhausting pursuits, keeps faithful pace even with feeble steps, and holds her canvas as a screen between us and the envious eyes of Time or the surly advance of Decrepitude. The best rest for doing one thing is doing another until you fall into a sound sleep. It is the vigorous use of idle time that will broaden your education, make you a more efficient specialist, a happier man, a more useful citizen. It will help you to understand the rest of the world and make you more resourceful…. I have known a few men that I would call truly great. They were all men who had vivid interests in idle time, interests that enriched the mind and made them more resourceful in their specialties. The man of narrow training and narrow outlook may work longer hours and yet fail to see what such men saw. Anyway, I hadn’t gone to London expecting to learn anything new about Churchill, but that’s the great thing about travel.